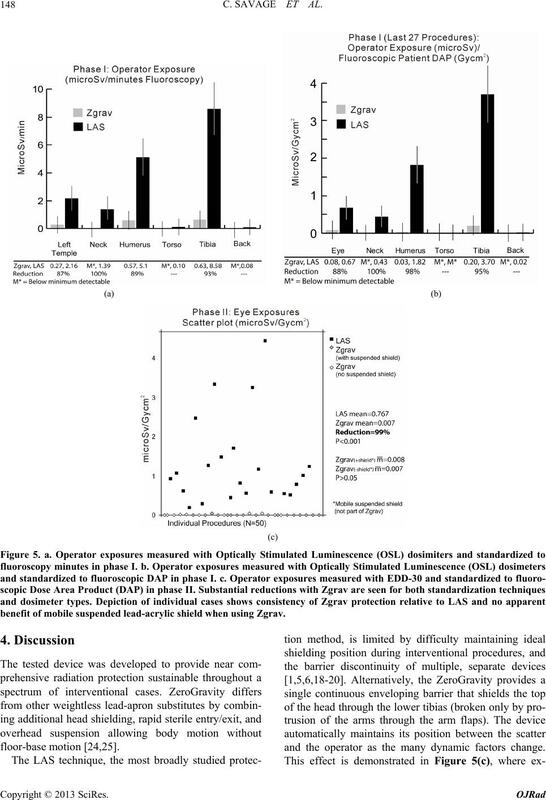 reduced for Zgrav with upgraded face shield vs. LAS, regardless of use or non-use of suspended shield with Zgrav. 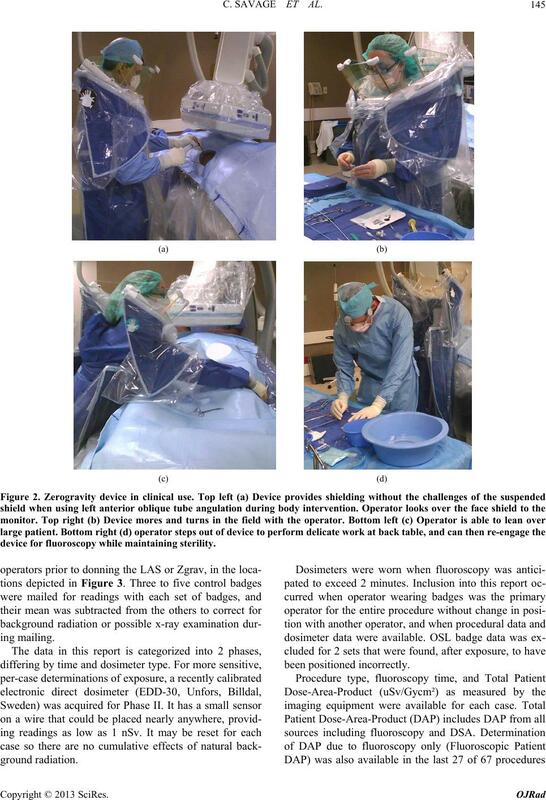 roscopy, allowing operators to perform procedures without potentially obstructive shields. conventional aprons and ancillary shielding. radiatio n protect i on system). thicker Pb throughout the apron (1 mm Pb). with Zgrav as depicted in Table 1. Table 1. 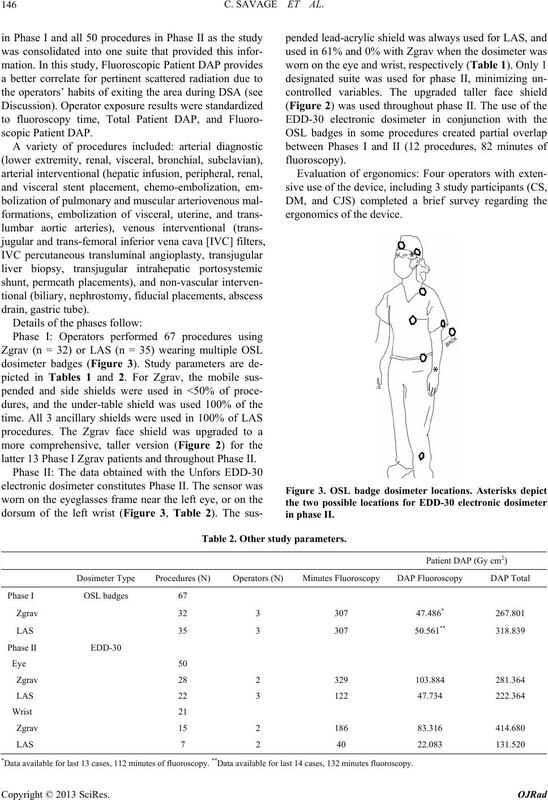 Ancillary shields used (proportion of procedures). tion of severely obliqued or lateral receptor angles. the right side of the table when possible. simeters was always in the primary operator position. 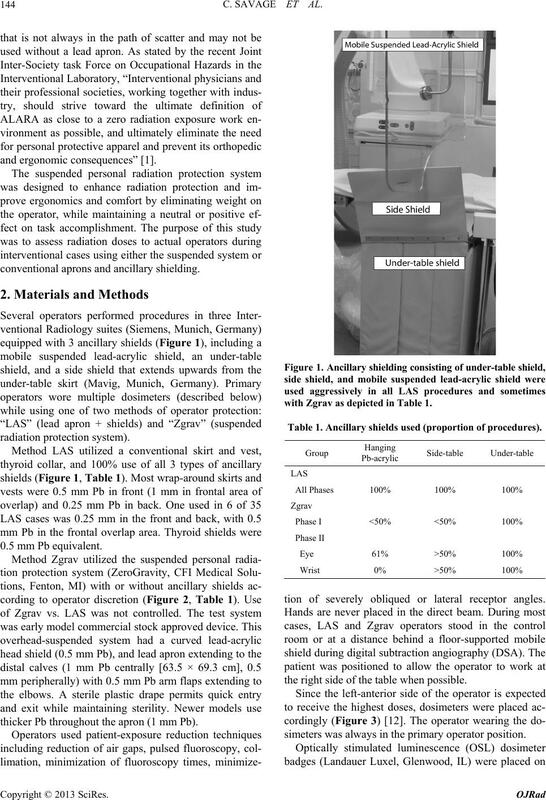 device for fluoroscopy while maintaining sterility. drain, gast r i c tube). latter 13 Phase I Zgrav patients and throughout Phase II. nancial interest in the Zerogravity device. line of sight to the monitor. 19], 92% reduction for later model [N = 13]). SD), vs 0.767 (0.19 to 4.44 ± 1.256) for LAS (P < 0.001). broad range of procedure types and operator positions. shield reduced eye exposures [5,6 ,2 0, 2 1] . cedures in Phase II = 0.39 uSv/Gycm². in 3 persons due to lack of back pain with lead apron. benefit of mobile suspended lead-acrylic shie ld when using Zgrav. and the operator as the many dynamic factors change. the Zgrav group were consistently substantially lower. face shield use similar Pb-acrylic (0.5 mm Pb). to thicker lead and greater surface area covered . patients and receive additional medical exposures . lower exposures than all studies using conventional means. cedure ty pe is at bottom. fingers in the direct beam. and did not affect procedure time. tional Radiology, Vol. 20, No. 2, 2009, pp. 147-153. Radiology, Vol. 79, No. 942, 2006, pp. 483-486. American Journal of Cardiology, Vol. 79, No. 1, 1997, pp. Vol. 13, No. 3, 2010, pp. 167-171.
diology, Vol. 21, No. 5, 2010, pp. 607-615. No. 2, 2007, pp. 233-243. Threshold Analysis,” Health Physics, Vol. 90, 2006, pp. search, Vol. 168, No. 4, 2007, pp. 404-408. No. 168, 21 July 2010, p. 26.
ogy, Vol. 14, 1998, pp. 1385-1388.
ology, Vol. 22, 1987, pp. 688-692. Medical Physics, Vol. 7, No. 1, 1980, pp. 8-12. Tumours,” European Journal of Cancer Prevention, Vol. 10, No. 6, 2001, pp. 523-529. Nagasaki, 1958-1995,” Cancer, Vol. 101, No. 7, 2004, pp. of Radiology, Vol. 71, 1998, pp. 728-733. 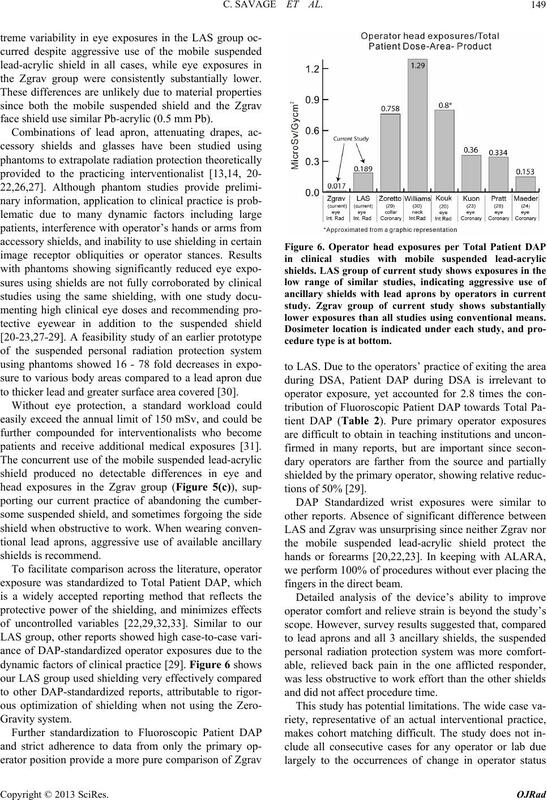 Protection Dosimetry, Vol. 10, 2010, pp. 1093-1097. Interventional Radiology, Vol. 21, No. 11, 2010, pp. terization and Cardiovascular Interventions, Vol. 67, No. 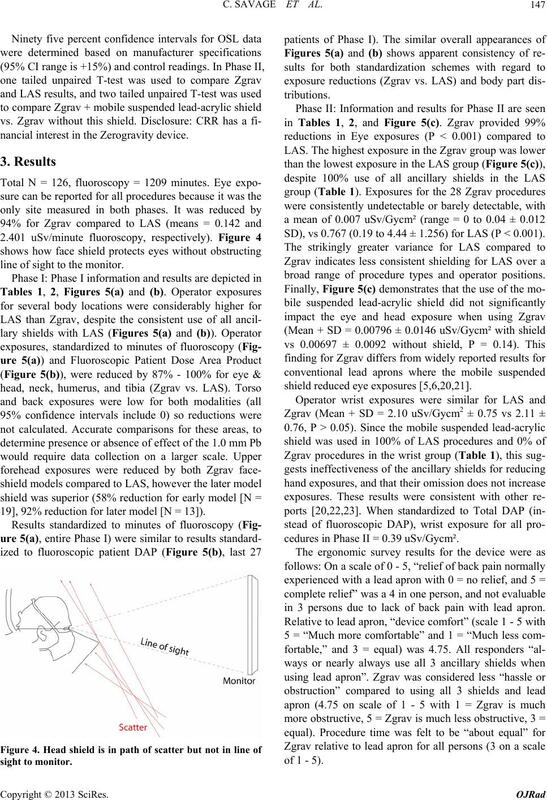 physiological Procedures,” European Heart Journal, Vol. 28, No. 2, 2007, pp. 183-189. No. 7, 2000, pp. 1364.
diology,” Radiographics, Vol. 26, 2006, pp. 1533-1541.
terization Procedures,” British Journal of Radiology, Vol. 66, No. 784, 1993, pp. 346-350. Radiology, Vol. 70, 1997, pp. 498-503.
ventional Radiology, Vol. 22, No. 4, 2011, pp. 437-442. 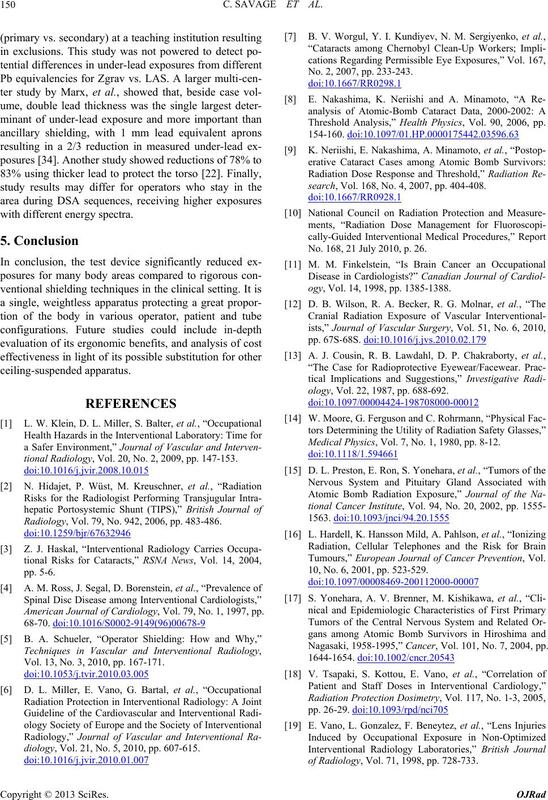 Is Warranted,” Radiology, Vol. 248, 2008, pp. 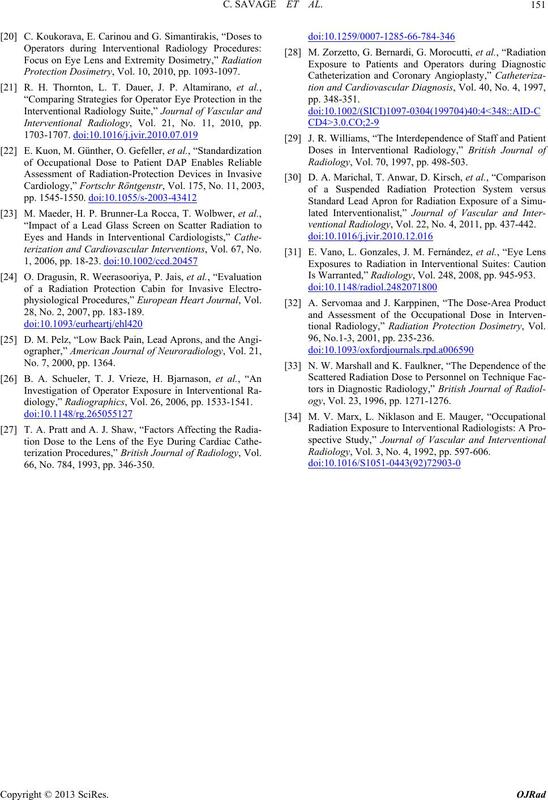 945-953.
tional Radiology,” Radiation Protection Dosimetry, Vol. 96, No.1-3, 2001, pp. 235-236.
ogy, Vol. 23, 1996, pp. 1271-1276. 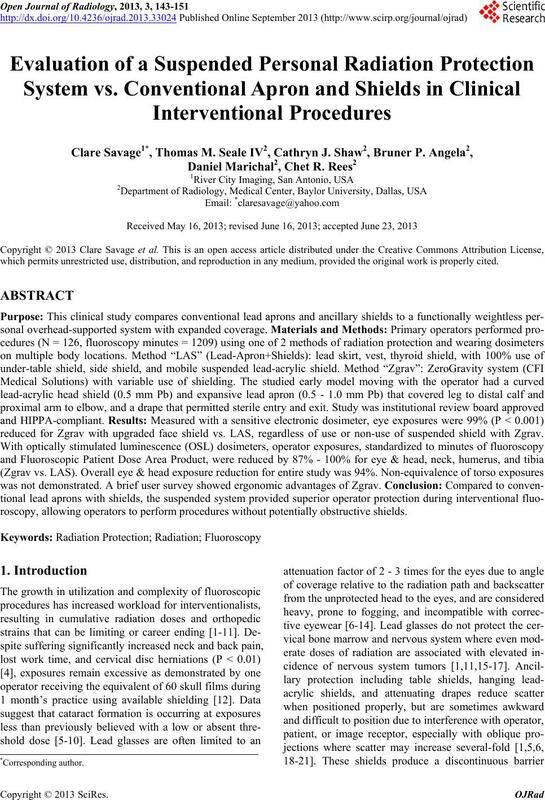 Radiology, Vol. 3, No. 4, 1992, pp. 597-606.